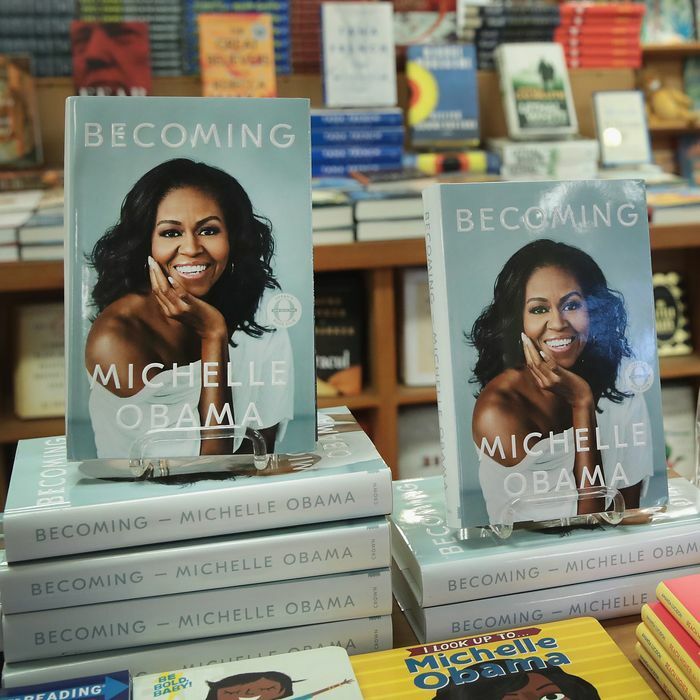 Michelle Obama’s debut memoir, Becoming, has only been on sale for three weeks, and news outlets are already calling it a “record-breaker” that sold 2 million copies in its first 15 days. But did it really? If it did, how would we even know? And could we figure out how the former First Lady’s opening fortnight stacks up against best sellers from years past? The short answer to that last question: “Good luck.” The business of accurately tallying sales in the publishing industry has historically been even more vexing than it is today. And though the internet has made it a little less difficult, a countertrend — the growth of digital sales logged by opaque corporations like Amazon — has muddied the waters all over again. Then there’s the term “best seller” itself; even book-business insiders don’t always agree on what it actually means. But that big number for Michelle — 2 million — is easier to interrogate. Here’s what we know about Becoming. After two weeks on shelves, Obama’s memoir became the best-selling book of 2018, according to Penguin Random House, which owns Obama’s publisher, Crown; Barnes & Noble, which called it a first-week sales record, and which, despite all kinds of problems, is still the country’s largest brick-and-mortar bookseller; Amazon, the online bookstore turned e-commerce giant; and NPD BookScan, which tracks roughly 80 percent to 85 percent of print trade book sales in the country. BookScan, introduced to some skepticism in 2001 yet now widely considered the most reliable source for tracking book sales in the U.S., indicated that, as of last Thursday’s weekly report, Becoming had sold 1,122,620 hardcover copies since it landed on November 13. (This week’s update raised that to nearly 1.5 million, but let’s stick to the first two weeks for simplicity’s sake.) Even considering the bump in first-day sales now afforded by the Amazon preorder button, that’s a lot of copies. As of the latest update, Becoming has now sold 365,000 more copies than BookScan’s No. 2 best seller for the year, Joanna Gaines’s Magnolia Table, published in April. It’s also sold a little over 440,000 more than Michael Wolff’s Fire and Fury, which was the year’s best-selling book for much of 2018 after being released to much media ballyhoo on January 5. So whence that number that got all of our attention — 2 million copies over two weeks? Why was Penguin Random House’s number bigger than BookScan’s by a margin of 875,000 copies? BookScan indicates that the book sold an additional 27,803 copies in physical audiobook, large print, and Spanish-language editions, bringing the discrepancy down to somewhere near 850,000. PRH also included Canadian sales, which BookScan doesn’t. Nor does the service account for e-books or a rapidly growing category of late: digital audiobooks. The companies that account for the lion’s share of sales of e-books (Amazon and Apple) and digital audio (Audible.com) don’t release numbers at all. Finally, there is the book tour — negligible as a sales driver for the average writer, but not for Obama. She had 16 events scheduled before canceling some overseas in order to attend George H.W. Bush’s funeral. At ticketed author events, books are often sold bundled with tickets and typically handled by a third-party vendor. If that vendor doesn’t report sales quickly enough — which, as many a book publicist has bemoaned to me in private, is common — those numbers don’t get to BookScan in time for the weekly tally. And since Obama was selling out major arenas like the 19,000-seat Barclays Center, those aren’t just a drop in the data bucket. Even best-seller lists, those yardsticks of relativity, vary wildly. PW and other outlets get their best-seller data directly from BookScan. But some have their own secret sauce — like the New York Times, which famously refuses to divulge its method, and whose lists rarely, if ever, mirror any others. Amazon runs multiple lists and releases no numbers. All of this makes determining a hard number nearly impossible, even when every list does have the same book on top. Which they all currently do: It’s Becoming. Whether the sales for Becoming were really “record-breaking” in the first two weeks is hard to tell. (That said … the Obamas’ book deal? Now, that’s a record-breaker. Was it worth it? According to an expert, “no clue.”) But 2 million in sales over the first 15 days is likely a fairly accurate estimate. One thing is for certain: Obama’s memoir is a runaway success by any sales measure. Its sales are likely to top 2.5 million copies as this week comes to a close. But I wouldn’t bet on it beating out The Lord of the Rings or Harry Potter and the Sorcerer’s Stone anytime soon. Did Becoming Really Sell 2 Million Books in 15 Days?